If ever you wanted a place to get away from it all, to an oasis of simple pleasures, visually pleasing, perfectly relaxing, laid-back, the Postcard Inn on St. Pete Beach on Florida’s Gulf Coast is the place. It’s 1950s retro done with a hip flare. 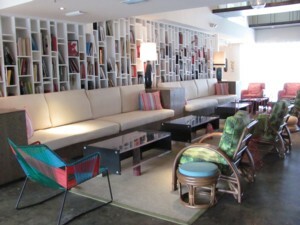 Kitschy and clever, and aesthetically marvelous – it’s amazing what design can do to create an atmosphere. Shapes, lights, colors – a chandelier is made from rope and sailors’ knots; painted skateboards and buggie boards provide the decoration, vintage lamps, 1950s photos of beach, a giant photo of waves breaking on the surf covers the entire wall..There is whimsy and humor which makes you smile a lot. 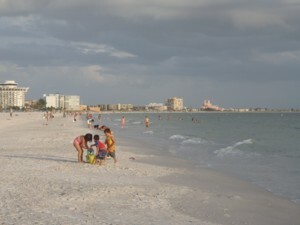 The Postcard Inn occupies prime beachfront in St. Pete Beach on Florida’s Gulf Coast – you can walk for miles along the beach, or float in the warm, green waters of the Gulf, very likely a dolphin or two not too far away. 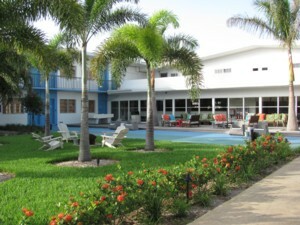 In addition to the Olympic-sized swimming pool (heated if necessary), there is a kiddie pool, two well-outfitted fitness rooms, a pool table and a ping-pong table, arcade room, beach volleyball court, and central garden areas where you can lounge in Adirondack-style chairs under the trees as music emanates from speakers. There is WiFi throughout; the rooms have flat-screen TVs; the rooms have views of pool, or Gulf, or garden. You can go for a swim in the Olympic-size pool in the morning or take a walk or a dip in the Gulf, before hopping on a trolley-style bus, to ride into downtown St. Petersburg in air-conditioned comfort, to enjoy the plethora of cultural and heritage attractions, including the Dali Museum, the newly opened Chihuly Collection, the Holocaust Museum, the Fine Arts Museum to list but a few (all linked with a charming system of trolley buses, the downtown ones offer a narrated commentary), then return to the Inn in time to linger on the sand beach, float in the warm Gulf waters (perhaps to see a pod of dolphins swim by, or pelicans diving for fish). The trolley also goes to south to Passe-a-Grille, an absolutely charming beach village with the prettiest parcel of beach on the island, and north into Clearwater, hitting all the other beaches along the way. For more ambitious exploring, you can visit Fort DeSoto or go kayaking at Weedon Preserve (rent from Sweetwaters Kayaks, 727-570-4844; www.sweetwaterkayaks.com). In the evening, you might cross the street to the Cockney Rebel Pub where there is karaoke Friday-Sunday. The Postcard Inn (the former Travelodge that was the first motel here in 1958) is as casual as a motel, as swank as a boutique hotel, with the charm and personal attention of an inn – including a marvelous continental breakfast. It also offers the Wildwood BBQ – a casual restaurant that brings BBQ to new culinary heights, specializing in multiple regional variations including Memphis-style, Carolina-style, St. Louis-style spare and baby-back ribs, dry-rubbed or wet, plus the most sensational nachos and skillet cornbread, as well as fish-of-the-day, burgers, sandwiches and salads, presided over by NYC’s Executive Pitmaster “Big” Lou DElrose. The bar is known for its Pina Coladas, Rum Runners and selection of Bourbon. There is also a Beach Bar where there is live music, a snack shack, and a banquet room accommodating up to 150 people, as well as catered beach functions for as many as 750. The restaurants and the inn, itself, is managed by BR Guest, which has more than a dozen restaurants in New York City (Blue Fin, Ruby Foos), plus two in Las Vegas, but this is its first in Florida. The Postcard Inn is a partnership between BR Guest and Starwood Capital Group (we hear they are talking about another Postcard Inn in Key West, Las Vegas or California). Rates are affordable: $99 in the summer, $189 at the height of tourist season. For all the right reasons – charm, services, amenities, affordability/value, location – the Postcard Inn on the Beach is becoming a wedding destination, and is superb family reunion place (they even accommodate pets, 50 lbs. or less, for a $50 pet fee per stay). Locals can take advantage of its “staycation” deals – special discounts for Florida residents, and a day rate (half the regular rate), enabling you to rent a room up until 5 pm., to use while you are at the beach and enjoying the hotel’s amenities. In another nice touch, there are vintage-looking postcards which they are happy to post for you. Dear Family: The Postcard Inn is picture-postcard perfect. Wish you were here. Postcard Inn on the Beach, 6300 Gulf Blvd, St. Pete Beach, FL 33706, 727-367-2711 main line, 800-237-8918 reservations, 727-369-4950 Wildwood, www.postcardinn.com. This entry was posted on July 26, 2010 at 10:13 pm and is filed under beach holiday, family travel, Florida, Gulf Coast, pet travel. You can follow any responses to this entry through the RSS 2.0 feed. You can leave a response, or trackback from your own site.